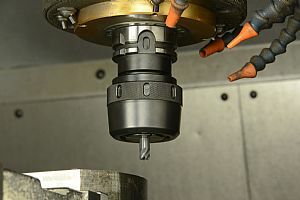 For manufacturers tangled in the process of deciding which solid carbide tool to buy from what supplier; NTK immediately does away with the legwork of finding the most productive or cost-effective solution. The new Ceramatic Series of solid ceramic end mills for heat resistant super alloys from NTK offers productivity levels 10 times that of solid carbide equivalents. Manufactured from NTK’s durable SiAlON SX9 grade, the new Ceramatic line is available with the option of a four or six flute variant. Ideal for manufacturers in the oil & gas and aerospace industries where Inconel, Rene, Hastelloy, Waspalloy and other challenging materials are the daily challenge; NTK has introduced a completely new geometry for the Ceramatic line with an optimised helix angle and cutting-edge design that provides an astounding level of toughness and wear resistance when machining particularly challenging heat resistant alloys. Not only does the new Ceramatic line deliver unsurpassed performance, it also provides flexibility with the four flute variant capable of conducting slotting, pocketing and ramping operations. Complementing the four flute end mill, the six flute variant generates superior toughness for face milling, side milling, profiling and ramping operations. The ability to conduct ultra high speed machining under these conditions is credit to the Ceramatic geometry that is particularly resistant to cutting forces under high load operations. This is the result of a geometry design that evacuates chips at speed whilst generating a smooth cutting action that minimises the cutting forces on both the Ceramatic end mill and the machine spindle. The composition of the Ceramatic end mill and the innovative geometry design enable the exciting new end mill to run at cutting speeds from 300mm/min to 1m/min on the most challenging alloys that machine shops are likely to encounter. Massively outperforming solid carbide end mills, the Ceramatic can machine at a depth of cut up to 2mm for face milling and slotting and a depth of 6mm for side milling. Both the four and six flute variants are available with a choice of 8, 10 and 12mm diameters with imperial dimensions including 3/8 and ½ inch diameter. The 8, 10 and 12mm four flute end mills have a neck diameter of 7.6, 9.6 and 11.6mm with a maximum effective length of 6, 7.5 and 9mm and an overall length of 60, 65 and 70mm respectively. The six flute Ceramatic end mill is offered in identical dimensions with the exception of the necked tool shank. Both variants incorporate a corner radius of 1, 1.25 and 1.5mm for the respective 8, 10 and 12mm tools. Machining with ceramic end mills requires a change in mind-set for end users; the Ceramatic line achieves optimum performance levels when running un-interrupted cutting at a minimum speed of 300mm/min with no cutting fluid. For further information please contact NTK.